When landing on the beaches in Normandy, the average British soldier carried a large amount of equipment. 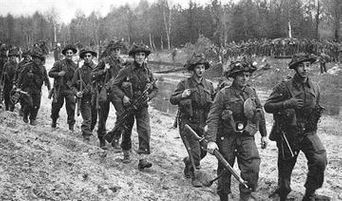 Each man carried ammunition, food, extra clothing, cooking utensils and entrenching tools as well as their weapons, uniform, helmet and personal effects. In short each man carried a great deal, and had to wade ashore carrying it all in up to neck high surf, whilst under sustained small arms and artillery fire. In the linked pages to this one you will see specifically what they wore and what they carried.